Podemos march, Madrid. 2015. via Wikimedia Commons. First published in the summer 2016 edition of Regards. Translated by David Broder. Last summer we interviewed the philosopher Chantal Mouffe about two of her recently translated books. The inspirer of Podemos and France Insoumise spells out her conception of left-populism. You offer an acerbic critique of the centrist political consensus and the grand coalitions which combine social democracy with the Right. Could you tell us what is at the centre of this critique? This centrist consensus has resulted in the creation of a terrain that is favourable to the appearance of right-wing populism. That is increasingly clear in France, and it is also very much evident in Austria. That was the first country that prompted my thinking on this point. Indeed, Austria has a lot more experience than other countries do of market social democracy and grand coalitions. I wanted to show how mistaken it is to argue that the centrist consensus is the sign of a more mature democracy. I had already advanced the thesis that this centrist consensus was a danger for democracy, and that it would create the conditions for a right-wing populism developing. Ten years later, we have to recognise that right-wing populisms have very much multiplied and gained strength around Europe. So in that sense I think that we urgently need to promote a left-populism. In what sense are you proposing not the abandonment of the boundary between Left and Right, but the construction of a left-populism? When I brought out On the Political, while I was already very critical of this centrist consensus — which is to say, the wiping away of any boundary between Left and Right — I still believed that it was imperative to re-establish this political boundary. I thought that the re-establishment of this boundary between Left and Right would mean the social-democratic parties rediscovering a left-wing identity. I must say that the way in which the social-democratic parties reacted — or rather, did not react — to the 2008 financial crisis removed any illusion on that score. There was a historic opportunity to haul themselves up to the level of Roosevelt and the New Deal, at a minimum. But the social democrats showed how incapable they were of resisting a centre-right line (saving the banks, implementing austerity policies, etc.). To speak of a left-populism is to take note of the historic crisis of social democracy. I think that social democracy is longer able to re-establish this boundary between Left and Right. So what would a left-populism mean? Through my contacts with Podemos, I came to think that we could no longer settle for addressing people who considered themselves as traditionally belonging to the Left. Today the popular base who could be won to a project of radical translation might be wider than that. That owes to both austerity policies and the precarious condition that the Spanish middle class has been put into. Indeed, it should now be possible to include this precarious middle class’s democratic demands in this project of liberatory transformation. That implies an effort to build a new political identity — a people, or, to adopt Gramsci’s expression, a collective will. In what sense do you mean "people" and "populism"? Thirty years ago in our Hegemony and Socialist Strategy Ernesto Laclau and I recognized that there was a crisis in social-democratic hegemony. But we still thought it possible to radicalize social democracy, and democracy in general, by integrating democratic demands that could not only be thought about in terms of classes. By way of example, here we were thinking about feminist and environmentalist demands as well as demands concerning sexual and racial minorities. Thirty years later, with the dismantling of the welfare state and the rise of national, religious and ethnic identities, the possibility of radicalizing social democracy has dissipated. We find ourselves in a situation where, faced with neoliberal hegemony, we are constrained to defend the very thing that we thought we would be able to radicalize. At the same time, we can also try to rally people who were not previously affected by austerity policies. Our lives and our bodies are all today affected by the consequences of a financialised capitalism. It is on this terrain that we can hope to build a transversal project. This construction of a transversal political identity articulated in an emancipatory project is what I call a people. It is a transversal project opposed to right-wing populism? Right-wing populism has understood and indeed profited from the fact that social democracy’s shift toward the Right has left a whole series of democratic demands from the traditional working class by the wayside. This traditional working class no longer feels politically represented by the traditional parties. As we can see in France and in Austria, the popular classes’ vote does not simply mean the reconstitution of a class vote that has now turned against the Left. While we might be unhappy about this fact, it is a cross-sectional vote, and that also means the popular classes rallying to moral, national and religious values which are articulated in a right-wing project. And I think we have to oppose that with cross-sectional democratic demands which are articulated in a left-wing project. That is what we need to do, rather than criticise the popular vote by morally condemning its attachment to xenophobic or authoritarian values. That is why I think that in Europe today we are in a populist moment. But what, then, is the difference between a right-wing populism and a left-wing one? The difference between a right-wing populism and a left-wing one owes to the fact that the former tends to restrict democracy while the latter works to extend and radicalize democracy. To adopt Laclau’s definition, populism, the creation of a people, has to do with the establishment of a boundary between an "us" and a "them," between the people and the establishment. Of course, this "us" can be constructed in very different ways, since the people is not a given, but corresponds to a political construction that also stands in relation with a "them." The whole question is what kind of relations are to be established between this "us" and this "them." That can take the form of a relation with an enemy that is to be destroyed and eradicated. It can also take the form of a relation with an adversary, with whom the struggle, the antagonism, is negotiated within the framework of democratic institutions — institutions which are transformed in order to extend and radicalize the pluralist framework of democracy. In this sense, a left-populism is not opposed to democracy and institutions, but instead corresponds to what I call a radical reformism. 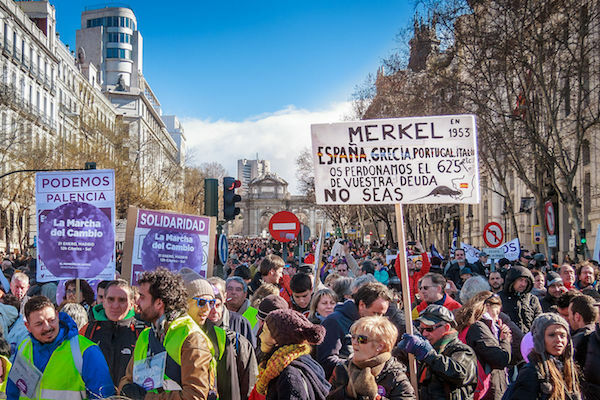 Engaging in institutions like Syriza has tried to do, and as Podemos would like to do, demands the transformation of these institutions in a radicalizing and pluralizing sense. What do you mean by pluralism? A people is not a homogenous entity. On the contrary, it is made up of relations between heterogeneous and often divergent demands. To take a telling example: for a long time I have lived in the United Kingdom, and in the 1970s and 1980s I was engaged in the feminist movement there. I remember a feminist movement that fought, within the print unions, for wage equality for women workers. At that time the typographers represented a sort of labour aristocracy, and they were largely if not exclusively men. As against the demand for equality, they fought to maintain the wage differential, and thus also the hierarchy between men and women. Articulating demands takes work, and a political construction that is never given in advance. I think that achieving this is far more difficult than the idea of a convergence of different struggles would suggest. It is anything but self-evident that struggles will spontaneously tend to converge. Articulating these struggles in their plurality means political work, and — as Laclau and I wrote — the construction of a "chain of equivalences." That also means the constitution of new forms of subjectivities. For example, making it unthinkable and intolerable for a feminist to promote a demand that is to the detriment of the working class or immigrants. Does the construction of what you call a people not resemble the illusion we saw with Occupy Wall Street and its "99%" — a people gathering and rallying in a unanimous and consensual way? Through my contacts with Occupy Wall Street I had the opportunity to write a text for their theoretical review, which is called Tidal. There I spoke out against the idea that all our problems come from a super-rich minority, which we simply have to eliminate in order for the people to be reconciled with itself… I have a bit of a sense of humour, so here I’ll cite Mao Zedong where he reminded us that there are also contradictions within the people itself. The fact that the people is heterogeneous and made up of differences and productive tensions between these differences should lead us to accept these differences, and to accept as pluralist as possible a framework for negotiating conflicts. This is what political liberalism does bring to democracy: democracy means not only the rule of the majority, but also respect for minorities. Indeed, I start out from the principle that what defines politics is an irreducible dimension of conflictuality, which is inherent to any society. Basically, without that dimension it would suffice simply to rationally arbitrate and administer conflicts, and politics would merge into what we call "governance." But the presence of an antagonism signifies a conflict that can have no rational solution — a conflict which is so impossible to decide on the basis of a rational decision, that it demands that we take sides. Taking sides — and for me, that is what politics is — thus introduces another fundamental element, which is the role of passions and emotions. I emphasise the fact that the construction of a political "us" is realised through the crystallization of emotions. The whole conception of democracy based on the theory of deliberation and communicative rationality ends up wiping that element away. That is why I find Carl Schmitt interesting, when he remarks that liberals claim to be able to talk about politics using a vocabulary borrowed from economics or morality. Fundamentally, liberals are trying to build a political philosophy without politics. How can we reduce this antagonism without trying to eradicate it? We have to give antagonism its proper place. We can do so by affirming that this antagonism can indeed express itself, in the form of a conflict whose protagonists recognise themselves as adversaries but not as enemies. That means that they recognise that they are protagonists in a conflict that cannot be resolved on the basis of rational and reconcilable choices. But all the same they allow for the plurality of points of view, in the framework of the democratic institutions that allow their antagonism to be tamed. So this does not mean eliminating the antagonism, but sublimating it. I want to emphasise this point, because it has indeed given rise to a lot of misunderstandings. The presence of an antagonism cannot be eradicated. If you will, it is comparable to a lion which a trainer has tamed, and whose strength cannot be eliminated, but only sublimated. That is the challenge for any democracy. So you are a Freudian? For me, the fact that the subject is divided, the fact that the subject falls prey to ambivalent emotions, and that there are no collective identities that are not the product of identifications, are incontestable gains of psychoanalysis. It is also in this sense that I take an interest — like Gramsci did — in the place of art and culture in the construction of political identities. After all, emotional identifications always result from our inscription in a world of cultural and discursive practices, the books that we read, the films we see, etc. We do not come to the world, and to the political world, without being crafted by all this culture and language. To repeat, this place for emotions and emotional identifications is essential. We are told that the Left should only use rational arguments, and hold itself back from addressing emotions, if it is not to engage in a form of populism and fascism. But you do not fight emotions with ideas, but with emotions stronger than those that you want to displace. And for ideas to have some force, they have to translate into emotions. Obviously I am not against rationality (otherwise I would not write books of theory). But it is important that the Left does not limit itself to a rationalist idea of politics. That is what Podemos has so magnificently understood. Those who do not understand the support that Marine Le Pen has been able to excite in France, or the FPÖ in Austria, are yet to grasp this point.